On Monday, August 31, the first Student Senate meeting of the 2015 fall semester was called to order by Tim Langholz, Forest Hills senior. Langholz opened the meeting by stating the new regulations for the campus organization and the budgeting process. New regulations and changes have been set in place by a collaborative effort from the Business Office and the Campus Organizations and Programs office. The major changes include having Student Activity Fee (SAF) funds residing in college accounts instead of separate, independent accounts. Transactions that are made through the purchasing processes set by the college now may be eligible for tax exemption. To go along with this, a new document was created as a guide to purchasing, including new forms. The college’s checking process has not changed, but instead student organizations will be following a new guide to purchasing that was created. Langholz then slated a new executive board, appointing six people to various positions. Clare Russell, Dearborn junior, was slated as Chief Financial Officer (CFO), although she did not apply for the position. Mitch Moore, East Lansing senior, was the previous year’s CFO and was not in agreement with Langholz decision. 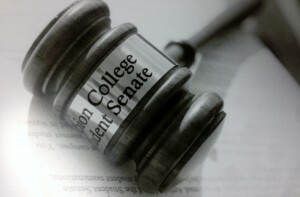 Moore has served on student senate for three straight years. He was elected Student Senator of the Year last year, primarily for his work in introducing the new Student Activity Fee (SAF) Financial Report. This new report allows the SAF to be available for for the college community to see where student senate is granting money and to which organizations. After the floor was open for discussion, many senators vocalized their disagreement regarding not slating Moore as CFO. After hearing the senators speak, Moore responded with a statement detailing his opinion on the matter. “This isn’t about me; this isn’t about Clare being a senator,” Moore said. “This is about how we treat our senators.” Moore accepted the responsibilities of CFO last year in the hope of using what he learned to better serve the CFO position this year. The slate was voted down by the majority of the Student Senate. A new slate was approved by the majority of Student Senate where Mitch Moore was chosen as Chief Financial Officer and Clare Russell as Appropriations Vice-Chairperson. Even with his decision overruled, Langholz expressed a gratitude for the conversation that took place in getting Moore back in the position as CFO. “I think that was really healthy and really good for us to do on Monday night. Clearly I made a decision that the rest of senate didn’t agree with, which is fine, we’re here for students, we’re here to represent them.” Langholz said on Thursday night. *Update: And earlier version of this article stated incorrect information pertaining to the the new SAF processes. Not all student organizations are considered non-profit and not all purchases made by student organizations are eligible for tax exempt. There is not a new checking process, but instead student organizations will be using the college system when they use money from the SAF fund. Temperance, Michigan, junior Natalya DiCiacca is the copy editor of the Pleiad. She is an English major and history minor with a concentration in secondary education. She also rides for Albion College's Hunt Seat Equestrian Team, is a member of Kappa Alpha Theta and is involved in InterVarsity.